Nevada Bob's Belfast's Damian Mooney returned to the winner's circle at the Synergy Golf St Margaret's Pro-Am. It's been a quiet summer by Mooney's normal high standards but there are signs that he could be finding some form at the business end of the season. The 48-year-old made a relatively sedate start to his round and was one over after six holes but he then clicked into gear collecting four birdies and an eagle over the final 12 holes to edge out Order of Merit leader David Higgins from Waterville by a shot. Higgins, the current Order of Merit leader, carded six birdies in total but dropped shots at the first and fourth let him down. He will however edge further clear of second placed Damien McGrane who finished in a tie for 10th. Edmondstown's Andy Hogan and amateur partners, James Lawless, Brian Tyrell and John Higgins collected the team prize with a superb total of 98 points. 72 P Devine (Royal Dublin GC). 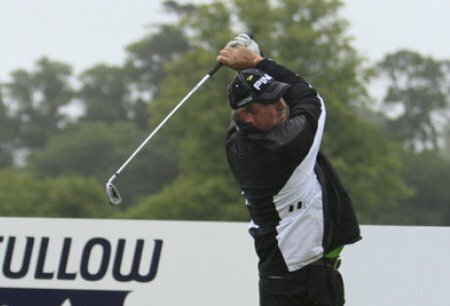 Damian Mooney fired a six under par 67 to win the PGA Challenge Pro-Am presented by Johnston, Mooney & O'Brien at Carton House on Monday. Ballyliffin’s Damian Mooney closed with an immaculate 67 to finish ninth in the Titleist PGA Play-Offs in Turkey and clinch his place in the BMW PGA for the first time since 2004. Dunne shows true grit with 64: “It was kind of a big round for me"